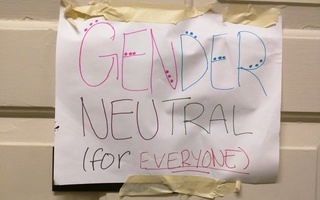 The repeat vandalism of a sign for a gender-neutral bathroom in Adams House sparked allegations of transphobia and prompted house administrators to email residents condemning the act. The sign includes three icons intended to represent male, female, and non-binary individuals. Adams House staff found the female icon colored in with a black marker Thursday night. After staff cleaned the sign, the icon was colored in a second time Monday evening. 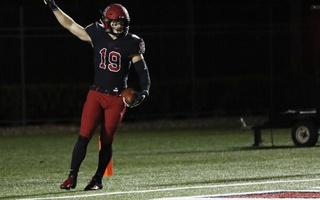 Adams Faculty Deans Judith “Judy” S. Palfrey ’67 and John “Sean” G. Palfrey ’67, along with Resident Dean Adam Muri-Rosenthal, wrote in an email to residents that administrators will meet to discuss the issue within the next few days. The markings ignited widespread disagreement among house residents after Lily E. Gulledge ’21 posted an image of the vandalized sign on an internal house email list. Some students wrote the blacked-out sign made them feel unsafe in the house; others questioned the vandal’s intent. Several students speculated over the email list that the vandalism was transphobic or sexist. Others suggested the bathroom’s proximity to a women’s bathroom — and the absence of a nearby men’s bathroom — may have inspired the graffiti. Gulledge, who serves on the Adams House Committee, said the vandalism was a point of discussion at Monday night’s committee meeting and that it upset several committee members. In their email, the Palfreys and Rosenthal wrote that resident tutors Eleanor C. Craig and Toby Oldham would host an “open dialogue” in their suite Tuesday evening. Adams House first introduced gender-neutral bathrooms in 2015. 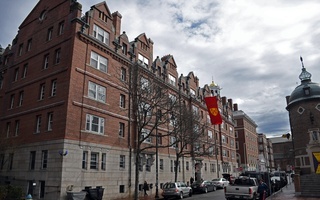 At the time, administrators pointed to the House’s history as a supportive space for BGLTQ undergraduates and said the change would make Adams more welcoming. Since then, several other houses have followed suit. In 2016, students in Eliot House shared photos of a broken sign for a gender-neutral bathroom over their email list. At the time, they said the act was sexist and offensive. Catherine Y. Zhang ’19, a resident of Adams House, said she was disappointed to learn of the graffiti. Zhang said she thinks the vandalism is unrepresentative of the Adams community as a whole. From the Gold Room to Westmorly Court, Adams is filled with history—a history that should be preserved to the greatest extent possible.